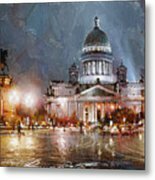 St. Petersburg.isaac Square by Ramil Gappasov - 10.000" x 7.500"
St. Petersburg.isaac Square framed print by Ramil Gappasov. Bring your print to life with hundreds of different frame and mat combinations. Our framed prints are assembled, packaged, and shipped by our expert framing staff and delivered "ready to hang" with pre-attached hanging wire, mounting hooks, and nails. Absolutely wonderful, congratulations on your sale! Ramil Gappasov was born in Krasnoyarsk, Russia. 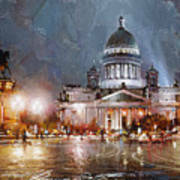 He studied at Moscow State Artistic-Industrial University, at the faculty of interior design. Ramil was worked on different design projects: private and public interiors. This experience set a direction for his painting. Ramil is the member of the MOOSKH and the International Art Fund. He lives and works in Moscow. Since 1991 – participant of art exhibitions in Russia and other countries. 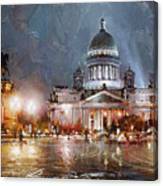 Ramil`s works are in private and corporate collections in Russia, Europe, USA and China. His paintings are in galleries: `Gallery Elite`(USA), Arcana Gallery '(USA), ' King's Gallery '(Hong Kong), Contemporary Art 'ArtNow'.